On arrival you are transferred to your lodge. There is time to meet some of the team for those arriving in the morning or afternoon. There are 2 full days of site visits & presentations with TFFT. We will also have time to have a comprehensive trip briefing and assemble bikes and do prep. From our lodge we ride on towards the Maasai steppe with a picnic lunch on route. The final section in the afternoon leads us to a camp near a spring. The riding is around 4 to 5 hours. Early breakfast to fuel up and a relatively early start are essential. We set of through bush on dirt tracks and the pace varies according to the terrain. Lunch is taken in the heat of the day and then afternoon is back on our bikes. In the late afternoon, we arrive in camp to re-hydrate and refuel our bodies. The routine starts to become apparent now and we are soon riding away from Nyumba ya Munga, a massive dam. The road now follows the Pangani river valley, along the very same trails of early explorers and slavers alike. In the late evening, we head into our camp near a nearby ancient hill or inselberg. The route continues down the Pangani river valley and on the left is a distinct mountain range. These are part of the 'Eastern Arc' mountains which are a biodiversity hotspot, veritable islands that have enabled endemic species to flourish over millennia. The going today is relatively easy but patience and determination are good tools to have! We rest in the heat of the day and then cycle into camp in the late afternoon. Our final Pangani river section. We push on down the Pangani river valley and make the most of the early, relatively cool hours and keep in tune with our bodies water / food needs. In camp we assess all team members for the upcoming sections and retire early to bed. Today's section is a mix of both biking and hiking. We cross over the main Moshi - Dar road and then finish our cycling at the base of the Usambara mountains. Here we have a lunch break before hiking up the Usambara flanks into one of the most piteresque camps on this route. In the evening we take sundowners with views of the plains below. In the morning there is a short visit to the local orphanage that partners with TFFT before we head off on a mixture of uphill and downhill sections as we cycle through the very heart of the Usambara mountains. Farming is the main source of income here, and despite the ridiculous slopes, villages are found throughout the ridges where the locals farm mostly maize. We camp near a forest. The downhill sections through the Usambaras are very steep. For those that are confident it is an adrenalin packed ride but never be shy to walk sections beyond your ability! We arrive at Mashewa, a trading junction at the base of the mountains, for dinner and overnight. From Mashewa we cycle around the East Usambaras and Amani reserve. The roads are generally quite good but we have to be careful of some traffic today as these are significant arteries in the local road network to the coast. The final section. Most of this day is downhill and we move from the cool to the humid coast. Pangani was the final point before slaves and ivory were shipped out on the Swahili dhows to the wider world. In the late afternoon, we arrive into Pangani and head to the beach to our beach lodge accommodation for a grand finale beach barbeque and party. ***From Pangani vehicle transfers are available to Dar es Salaam / Arusha although some may prefer to take schedule flights to Zanzibar or further a field. 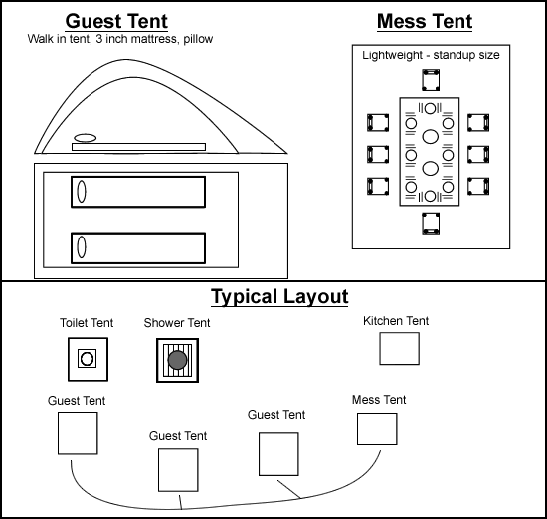 The following are the basic layouts and information on accommodation for the camping sections. There are some nights that are spent in lodges and or hotels, notably at the beginning and the end. It is important to note that most nights will be spent camping. Camp will be set up when we arrive at the end of each day of riding and taken down and moved by the Adventure International staff. That means that whilst we try to make this as comfortable as possible, water for showers will be limited to around 15 liters per person per day (Where sufficient water is available). Most toilets will be short drop style with a portable toilet seat and toilet tent. Morning fuel up: carbohydrates with a mixture of other food and fruit. Daytime snacks: keep your energy levels up and replenish lost fuel and minerals. Bananas are always on hand but bringing your favorite energy bars / goos / energy tablets, and plenty of them, is a good idea. Lunch break: some down time with breads, fruits, mixed nuts and fluid. Afternoon snacking as per the daytime snacks. Dinner: plenty of carbohydrates with a meat / sauce / vegetables. Please note that people with special dietary requirements can normally be accommodated, but let Adventure International know if you have ANY allergies or dislikes. Click here for the recommended packing list.